And the BBC has tracked down several victims of the rounds in Northern Ireland - all of whom responded with horror to the idea of them being used in England. Stephen McConomy was killed by a plastic bullet after being shot in the head by a soldier at a demonstration in 1982 at the age of 11. The man who pulled the trigger claimed to have fired by accident and was never prosecuted. Stephen's brother Emmett said: "I am shocked that they seem to be stockpiling these things. The injuries they can cause are absolutely horrific. "They should never have been used in Northern Ireland and it would be absolutely wrong to use them in the UK - they are indiscriminate." Mr McConomy continued: "My brother was just 11 years old when he was hit in the back of the head from just feet away. "It was so powerful it threw him down the street." The weapons have been blamed for 17 deaths in Northern Ireland, although the weapon has since been redesigned in an attempt to make it safer. But Mr McConomy, who has campaigned against the weapons, said: "My understanding is that the current baton rounds actually have a higher velocity than the previous ones. "For a baton round to stop an individual it has to be powerful." Photographer Tony Murray was accidentally hit on the leg by a modern baton round while covering a demonstration for a local newspaper in Belfast last July. He said: "It was like getting hit with a 10-pound lump hammer. It took weeks and weeks to recover. "According to the hospital it's deteriorated the muscle in my leg - and it's given me a sciatic nerve in my other leg because I ended up putting too much pressure on that." Mr Murray said the worst bruising was on the other side of the leg to where the projectile hit, because the shockwave went through his flesh and out the other side, leaving a large yellow and black bruise. He added that seconds before he was hit he had been kneeling down - and he only narrowly missed being struck in the head. Mr Murray continued: "It had that much power that if it had hit me on the skull it could have killed me. "Am I concerned about so many being stockpiled in London? Big time." Paul O' Connor, an advocate at human rights campaign group the Pat Finucane Centre, has also campaigned against the use of baton rounds. He said: "They have always led to deaths and serious injuries - they have led to the deaths of eight children. "Their use is a very considerable risk to children because their skulls are much thinner." He continued: "There is also a risk of police using them as a retaliation. "An officer might think, 'oh, there's that so-and-so giving me the finger - I am going to get him'." Mr O'Connor added that in his experience baton rounds were more likely to inflame disorder than quell it. However, the use of baton rounds does have its supporters. Former Met Commander Roy Ramm said: "I don't think there is any doubt their use can be justified, but the circumstances have to be right. "At the end of the day it's a matter for the guy actually holding the gun to make that decision. "Any use of force against a person can prove lethal - whether it's a truncheon, whether it's a baton round, even physical force from a police officer." He continued: "It has to be exercised with great care - and you would not see the Met rushing to use these. "They will be used in extremis if officers really thought life was at risk or really serious damage to property was imminent." Mr Ramm said there was "no doubt" the decision to increase quantities of baton rounds had been sparked by last year's rioting. Met Assistant Commissioner Maxine De Brunner said: "We have learned since the summer and did decide that 10,000 was more appropriate to have in storage. 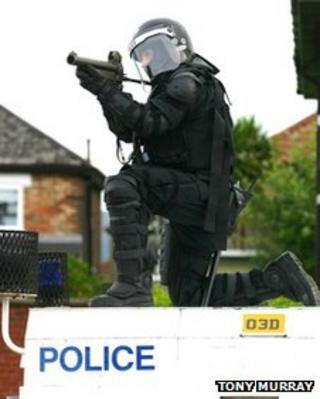 "They have never been deployed in a public order situation. "They have been authorised, but it's not a tactic we would want to use." She continued: "It is something we would want to have available. "But it's not our preferred method - it's our job to facilitate peaceful protest and that's what we always hope to achieve." Meanwhile, hundreds of cases of people accused of being involved in last summer's London riots are still being prepared for trial, the BBC has learned. Figures from the Crown Prosecution Service (CPS) show that it has 450 cases still to deal with and that 200 are at trial stage.